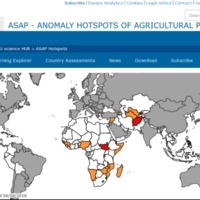 ASAP is an online decision support system for early warning about hotspots of agricultural production anomaly (crop and rangeland), developed by the JRC for food security crises prevention and response planning anticipation. What - Frequent updates for timely early warning on an open access web interface - Combination of automatic warning classification and monitoring by JRC analysts - Homogeneous approach at global level based on state of the art use of weather and earth observation data - Short global overview and country narratives for users without experience in the use of geospatial data - Zoom into hotspot areas with high resolution imagery for vegetation anomaly mapping at parcel level How ASAP provides information at two levels: 1) monthly identification of agricultural production hotspot countries and summary narratives by JRC experts for agriculture and food security analysts, for example in DG DEVCO and EU delegations; 2) ten-day automatic warnings about low or delayed vegetation performance at province level plus weather and Earth Observation vegetation indicators for JRC and external technical experts. Where The hotspot identification focusses on 80 countries: - where food security and rural development is an EDF (European Development Funds) focal sector; - or which are monitored by the GEOGLAM Crop Monitor for Early Warning. When The automatic warnings at provincial level are published on the ASAP Warning Explorer every ten days two or three days after the end of each ten-daily period (e.g. 2nd-3rd, 12th-13th, 22nd-23rd of each month). The hotspot assessment is published at the end of each month (e.g. after 27th) with information related to the previous 30 days. Why ASAP supports multi-agency early warning initiatives and provides information to food security assessments, to the IPC (Integrated Food Security Phase Classification) and to Cadre Harmonisé, which are the basis for the annual Global Report on Food Crises. It also directly feeds into the GEOGLAM Crop Monitor for Early Warning. Who The ASAP system is developed and maintained by the Food Security unit at JRC of the European Commision. Rembold F., , “ASAP - ANOMALY HOTSPOTS OF AGRICULTURAL PRODUCTION,” Bibliothèque numérique de Racines-Sahel.org, consulté le 19 avril 2019, http://racines-sahel.org/bibliotheque-numerique/items/show/43.